Buying food at the market. Noting that some 800,000 households in Canada are unable to meet their daily food needs, an independent United Nations expert today called on the country to adopt a national right to food strategy. “Canada is much admired for its achievements in the area of human rights, which it has championed for many years. 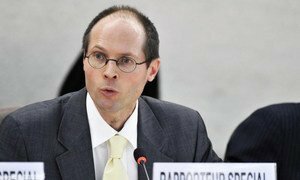 But hunger and access to adequate diets, too, are human rights issues – and here much remains to be done,” the Special Rapporteur on the right to food, Olivier De Schutter, said in a news release at the end of an official visit to the country. “What I’ve seen in Canada is a system that presents barriers for the poor to access nutritious diets and that tolerates increased inequalities between rich and poor, and Aboriginal and non-Aboriginal peoples,” he added. Mr. De Schutter called on the Canadian Government to convene a national food conference that would clarify the allocation of responsibilities between the federal level, the provinces and territories in order to deliver adequate and affordable diets for all. He noted three main concerns that need to be addressed in a national food strategy. The first is that a large number of Canadians are too poor to afford adequate diets. “This is a country that is rich, but that fails to adapt the levels of social assistance benefits and its minimum wage to the rising costs of basic necessities, including food and housing,” he said, noting that 800,000 households are food insecure in Canada. The second concern is that more than one in four Canadian adults is obese, and almost two thirds of the population is overweight or obese, costing at least $5 billion Canadian annually in health care costs and in lost productivity. Thirdly, regarding the situation of Aboriginal peoples, Mr. De Schutter called for a reform of the Nutrition North Canada programme that subsidizes retailers to serve remote communities, as well as a structural approach to tackling the socio-economic and cultural barriers to opportunities for those living on reserves that result in their not enjoying fully their right to adequate food. The Special Rapporteur will present his final report to a forthcoming session of the Human Rights Council in 2013. Globalized food systems and the spread of Western lifestyles has spawned an international public health disaster with over a billion people suffering from undernourishment while another billion remain overweight or obese, an independent United Nations expert warned today.